There is one area of our bathroom that always makes me cringe when I look at it. It’s our shower doors and tracks and the limescale and mineral deposits that had built up on them. 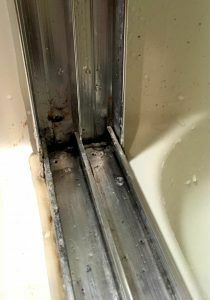 Here is the blunt truth and no judging but I have never really cleaned around the shower frame or door tracks. 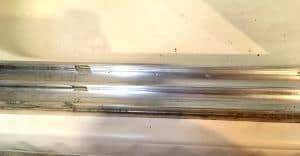 How to clean shower door tracks? I really wasn’t sure. So I’m pretty sure when we moved into our house years ago that there was already some buildup on the shower door frame and tracks. That combined with not knowing how to clean it or even if it could be cleaned and honestly, a little laziness, I just tried to ignore it. However, I finally realized that I needed to try to tackle it. Below you will find my process and results. I tried to take some before, during and after pictures. I don’t feel like they fully capture the essence of the task at hand but I will give you one picture to start to give you an idea of what I was in store for. I did some research online looking for the best method (and easiest) to remove the build-up. I decided to start with the vinegar method. It seemed the simplest and I already had vinegar on hand so off I went. The first step was to pour vinegar into the shower tracks. My tracks have little holes to allow the water to drain out so I plugged those with paper towels. That wasn’t the perfect solution as it still drained out once the paper towel was soaked but it did a good enough job. A rag or something thicker than a paper towel may work better. After I let the vinegar sit for about 30 minutes, I removed the paper towels blocking the drain holes. Then I grabbed a clean paper towel and wiped out the tracks. Most of the grime and stains from within the shower door tracks were removed with that one swipe! I grabbed a toothbrush and scrubbed the hard to reach places that I couldn’t reach with the paper towel. (If you don’t have an old toothbrush, I found a multi-pack for a $1 at Walmart). There was still a little area under the door in the track that I couldn’t reach with the toothbrush. For under the doors, I used a paper towel soaked with vinegar and gently shoved it under the door in the track. Since I already had let the vinegar sit in the tracks, the grime was already loosened so it didn’t take much to clean it. For the vertical tracks, I soaked some paper towels with vinegar and shoved them into the tracks and let them sit. As I removed the paper towels, I wiped down the tracks as I removed them and then used the toothbrush again for the tight corners. Now, I moved on to tackle the mineral build-up on the top and outside of the shower door tracks, as well as some vertical part of the tracks. I really didn’t know if they would be able to come clean but I was going to give it my best shot. I mixed some baking soda with water in a little bowl to make a paste. Using a rag, I applied the paste to the build-up on the top and outside of the track and in the vertical section of the track and let it sit there. I don’t remember how long I let it sit there as I was working on other things but I would say probably 30 minutes. I wiped off the paste with a wet rag and surprisingly, quite a bit came off in the first swipe. 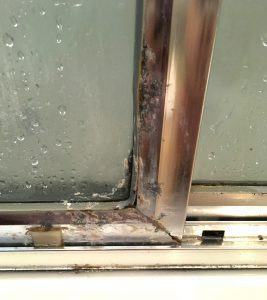 If your doors don’t have a lot of build-up like mine did (and I’m sure they probably don’t), you might be done with that initial cleaning. Unfortunately, due to my lack of cleaning, this task was going to take some elbow grease. I repeated the baking soda step over again. This time instead of wiping it off with a wet rag, I used a little metal scraper and scraped the mineral deposit build-up. Some areas required more than others, especially the top of the shower door track right section next to the wall. Since that one spot had so much build-up, I actually had to chip away at it with the metal scraper. I repeated with baking soda over and over until finally the build-up was gone! Again, I started with the vinegar. I poured some into a spray bottle and sprayed the vinegar at the top of the build-up and let it run down the grime. 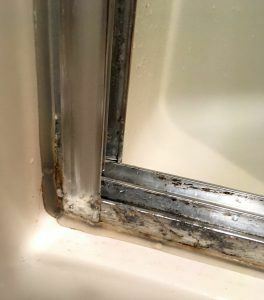 I also used the baking soda paste to remove the grime and build-up that was still left on the metal edges of the shower doors. Just as I did with the shower door tracks, I applied the paste to the door and let it sit. Then I wiped and scraped off the build-up from the shower door corners and along the bottom of the door. Thankfully, this was not anywhere near as bad as the tracks so I only have to repeat it once. **Disclosure** You may notice in the after picture that there is still some build-up on the door and edge. I had to stop to pick up my kids at school, so I will need to finish it on another day. After I finally got the limescale and mineral build-up off, I washed everything down. I gently poured water into the tracks to remove any leftover dirt and grime being careful to not overflow the tracks. I used a clean, wet rag to wash everything else. One of the benefits of the vinegar and baking soda method is that they are natural cleaners. I figured since they were natural, I wouldn’t need gloves. Through my lengthy cleaning process, I learned that while they are natural, gloves would have been a good idea. At the end of the day, the skin on my fingertips was incredibly dry and peeling. While this obviously isn’t a really big deal, it is a little sore and inconvenient. If I ever have to do an in-depth cleaning again, I will be wearing gloves. If your shower door tracks have a lot of build-up like mine, I want to be completely honest. I don’t want to make this seem like a quick wipe and you are done. However, with some elbow grease, you can get the build-up off and it is definitely worth it! In order for me to not have to go through this again, I will be wiping my doors down and cleaning on a regular basis. Now instead of hating to look at my shower doors, I actually look at it and smile. I can’t believe the difference! I just wish I would have spent the time and done it years ago! Not only does it look so much better but it actually feels great to accomplish something! What a difference and for just simple products you have on hand. I know! I wish I wouldn’t have waited so long before cleaning my shower doors! 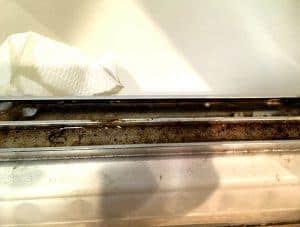 If you cover your drain holes with duct tape first, then pour in baking soda and then vinegar and let it foam up, sit for 30 minutes, and then wipe it down. See if that works any easier for you. What a great idea to clean the floor of the shower! I will have to try that. I am sending this to my mom! She just installed these kind of doors, it will be a helpful yearly cleaning technique! A yearly cleaning technique is a great idea! That way you won’t have to scrub as much as I did. 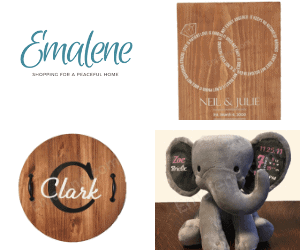 For brand new doors send her a norwex window cloth. If she wipes them down after every shower, she will never have to scrub them. Thank you for this! I am going to try using these on our shower TODAY! I love that they are both natural cleaners, I’m preggo and worry about using harsh chemicals right now. I also love the fact that they are both natural. 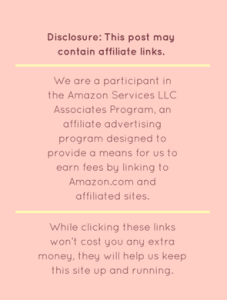 I would love to know how it works out for you. What a difference! I try to use natural products when possible, it is so much better for us, our pets, and the planet! I’ve learned the hard way about waiting too long to tackle those type of things, and then it becomes such an ordeal. I use vinegar and baking soda all the time to clean around the house. All natural but it works. I couldn’t believe what I was missing out on when I discovered the vinegar and baking soda combination! Baking soda + vinegar = magic! 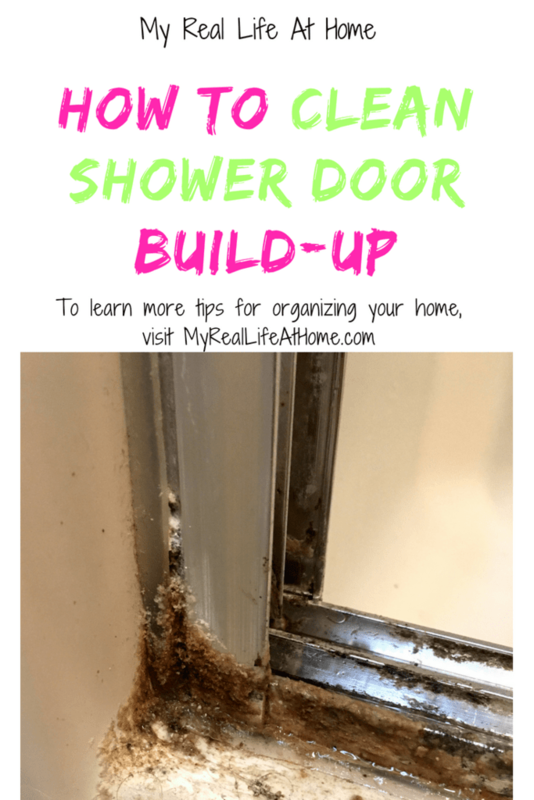 I definitely have some buildup to get to on my shower doors! I’m not very particular about what cleaners I use, but this is for sure cheaper than CLR and much more effective! 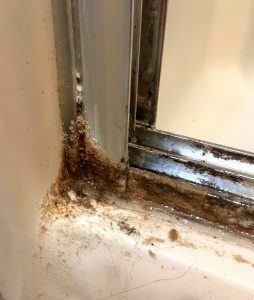 I would love to hear how the baking soda and vinegar combination works on your shower door buildup. Hopefully, your build up isn’t as bad as mine was! For the doors I use this mix bi monthly and it keeps the doors looking like new! In a spray bottle, combine equal parts water and vinegar. Add one to two tablespoons of regular dish soap. Seal and shake the spray bottle to mix the components together. Spray the mixture on soap scum and allow to sit for 15 minutes. Dawn and vinegar is also a great cleaner! I use it for my bathtub and shower walls all the time. 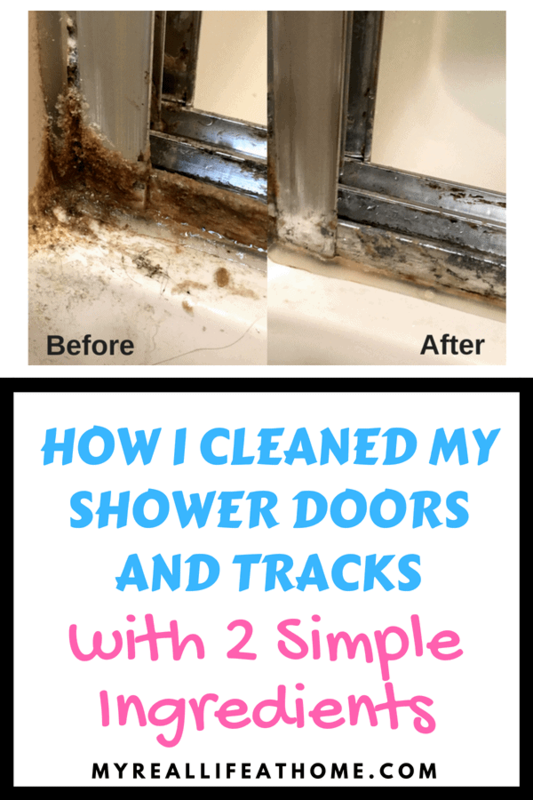 I found the baking soda mixture cleaned better for my shower doors and tracks. I use baking soda and vinegar quite frequently with cleaning. The bathtub and shower doors are definitely a chore. I recently saw a pin that suggested using warm vinegar and the blue Dawn soap together. I heat up the vinegar in the microwave. (Then the microwave is easy to wipe down.) And mix the Dawn soap in the pyrex measuring cup. First time I tried it I poured the mixture in the plastic bottle too quickly and it melted my bottle. But it still works so it is good. I will then spray down the shower doors and the bathtub walls and let it soak overnight. It does take some scrubbing as well to cut through the grime build up. But it is so worth it. Try it! You’ll like it. For really tough grungy areas, apply your baking soda paste, then after about 20 minutes, spray w/ vinegar. After the “sizzle”is done (you’ll know) wipe it out. It works like a dream and helps to reduce the elbow grease needed. How could someone’s shower get to that point though? It would probably take at least 2 year of intentionally not cleaning them to be like that. OMG, I was thinking the exact same thing!! I wouldve thrown imaginary renters or anyone under the bus before owning the before picture of that shower! If you don’t have something constructive to say, don’t say anything. I’m sure she knows her shower doors had gotten out of hand, but she was trying to help others who find themselves in that situation to show that what might look hopeless (which would make some people ignore it even longer) that it CAN be taken care of. Don’t criticize if you haven’t been there. FYI…when you have hard water unlike people who have city water, it doesn’t take very long for that kind of buildup. Quick cleans or average cleaning doesn’t begin to make a dent in the mineral deposits! Well I applaud your courage in showing the pictures, bravo! 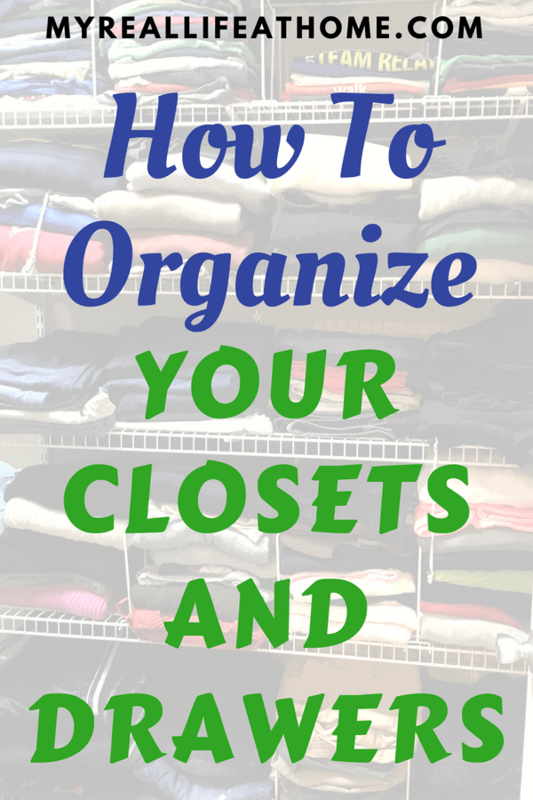 We’re not all clean freaks with “show room” homes every day of the week. I live in Australia, and while it’s not the politically correct thing to do, I use “Domestos” (well the generic equivalent of it) to clean my shower, as I have a very bad back, and can easily herniate or split a disc open cleaning it. So my shower can get very dirty before it gets cleaned. So my equivalent of Domestos is the Coles toilet cleaner which sells for about $1.80AUD per 2 litres and I just squirt it on neat, let it sit for a bit, then spread it around to cover everything, get in naked, cause the stuff will bleach your clothes – got to be careful cause the stuff is slippery, scrub a bit if necessary and rinse off while I’m having a shower. I do this about every 6 months, as we use shower gel and have a negative ions shower which reduces soap scum, so less dirt and mess. It’s the best I can do unless hubby does it for me. I have tried this recipe for years and it ALWAYS works. If you don’t like the vinegar smell I usually take citrus fruit peels and a mason jar and pour the vinegar over the peels and leave it for a week or longer. Then I strain the mixture into my spray bottle. That’s a great idea! I will have to try that as the smell of the vinegar can be intense. 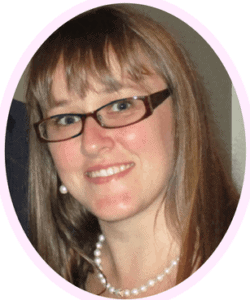 Hi Julie…I live in a hard water area…I mean white rocks on the shower door hard. My solution. I put a shower curtain inside the shower doors. 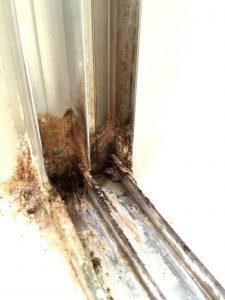 It slides out of the way when not in use and prevents water and soap scum build up on the sliding doors. I also keep Dawn and vinegar in a spray bottle. 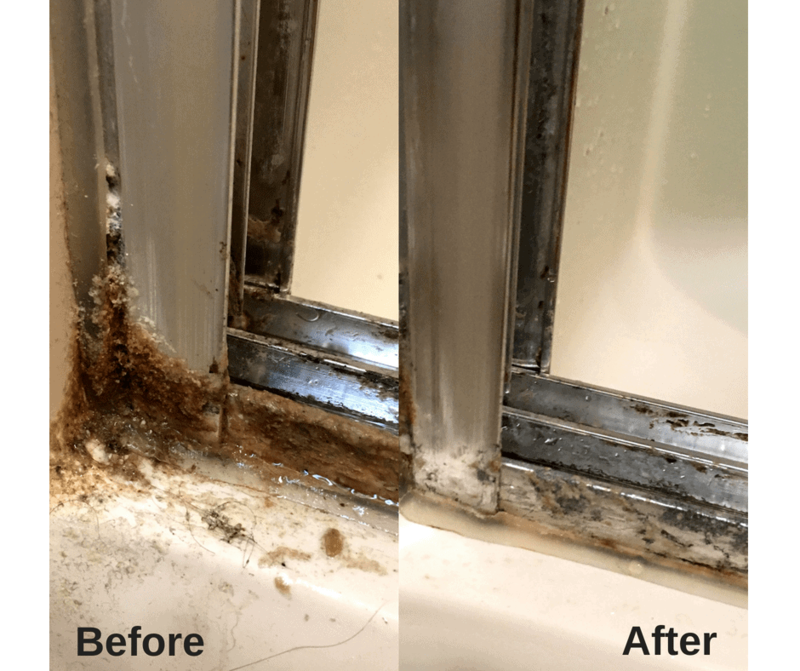 If you start with a clean shower and spray it down every week or so, you’ll never have to clean it again. It works miracles. That’s a great idea! I also love the fact that it would allow me to add a splash of color with a shower curtain. The spray is also a great tip. Citric acid powder, that is recommended to clean coffee pots, works wonders on calcium build up. You can usually find it cheapest in the bulk food section of the grocery. Mix 2 tablespoons to 3 cups of water, stir to dissolve. I wet an old cloth or paper towel and wipe. For really heavy build up let the soaked cloth sit on the build up and then wipe off. very little elbow grease needed. be careful not to leave sitting on colored fixtures for too long . Rinse when you are done. Wear gloves, as it is drying like vinegar. 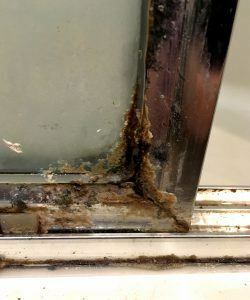 I’ve been struggling with the glass doors, doesn’t the vinegar/baking soda past work well on that too? I’m sure it would. Vinegar and Dawn also works great. I have a post on it here.